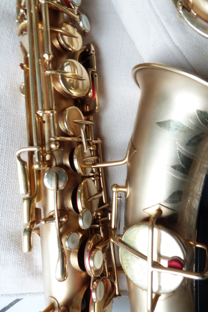 This magnificent gold-plated Buescher True tone alto saxophone looks like new. 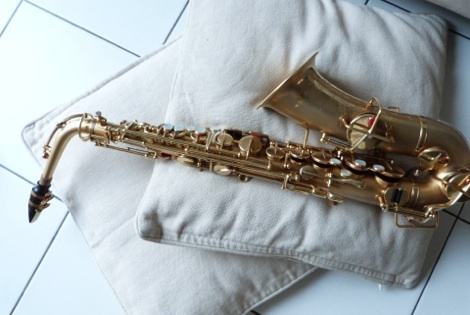 It was nevertheless made in 1928, and is then one of the most looked upon by Sigurd Rascher’s followers, who considered that a change was taken after 1930 in instrumental making, which was no more in the line proposed by Adolphe Sax. 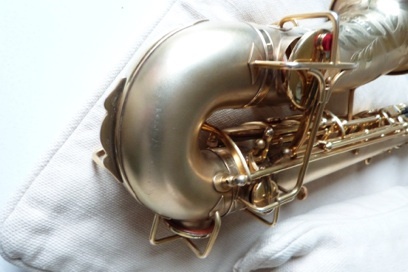 Played with a Rascher mouthpiece, its ergonomy is effectively very different than that of a modern saxophone. 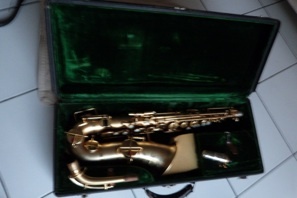 Some other particularities : a G# closing key (downside the F), mother of pearl on the octave key and the thumb support, a Rascher very short mouthpiece with an enormous inside chamber, and a high impedance (resistence) at blowing, much more than modern mouthpieces. And the low keys aligned on the instrument’s body. 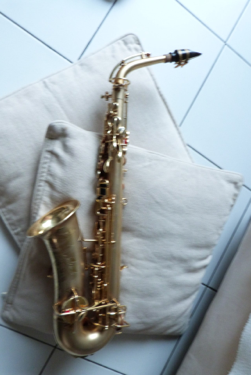 Before the ingenuous invention of the Balanced Action system by Selmer, placing the low keys plateau flat and decentered on the side : it is here visually good-looking, but very heavy on the auricular ! 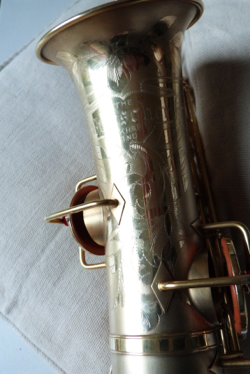 A very nice engraving on burnished metal, contrasting with the satin finish of the body, constitutes one of the elements of the de la luxury finish of this saxophone). 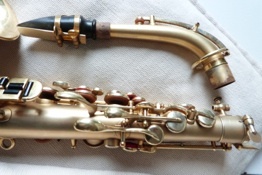 We can note the reversed position of low B and Bb (the instrument does a «bravo» on a trill Bb-C), a position which results probably of the adjunction of low Bb around the beginning of the XXth century. The following instruments will choose to place both keys on the right (underneath, USA) or the left (upside, France). This photo shows the typical Buescher cut of the down curve reinforcement (tenors have a similar reinforcement on the neck, forming a kind of semi-oval face called «man in the moon»), but also an unusual key : the clear E opening in parallel with the D key. 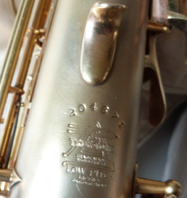 His serial number over 200 000 makes it one of the last True Tone saxophones, before the making of the «Aristocrat» model .